6 in. x 6 in. x..
Chip Size :1 in. Diameter Sheet Size : 12 in. x 12 in. 1 inch Diameter Stainless Steel Metallic Mosaic in meshed on 12 in. x 12 in. Sheet Tiles for Kitchen Backsplash, Shower Walls. Each tile is one square foot. 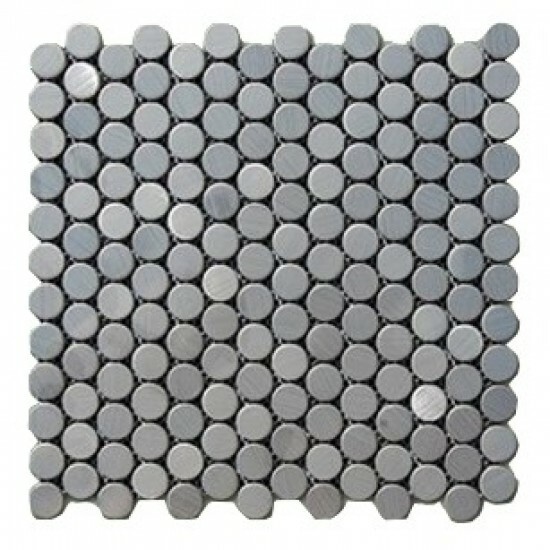 We also carry onyx mosaics in Gold, Red and Green Onyx in color. Give us a call and talk to our designers about your project. We offer discounts to Designers, Builder, Contractors and Architects. These tiles can be simply cut with a household scissors into any pattern so you can use them as you like.